Both Gilkerson and Rankin identify three models of American Boarding Axe and agree roughly on their periods of manufacture. Gilkerson identifies them by three types and this has become accepted terminology. Prior to the start of the American Revolutionary War (1775) naval equipment was British, whether locally produced or imported and after that date local production continued to make weapons to those familiar designs, so early American naval axes are similar to those of the British until the Type I was introduced around 1797. The first US patterned axe, Type I, is very rare and Gilkerson suggests that approximately 2000 of these axes were issued between 1797 and 1806 but possibly as late as 1810. Production of the Type II may overlap that of both the Type I and Type III. It is probable that there was no official pattern for this axe as the supply demands of the 1812 war with Britain caused a crisis in arms supply and navy purchasing agents ordered equipment from many different suppliers wherever they could. The shape of the axe and spike show slight variations due to the different manufacturers and it is not known how many were made but examples are rare. Type III axes were produced from 1812 onwards until about the middle of the century. All three American types are distinguished by deeply cut teeth designed to assist with hauling and snagging rope; no other country adopted this design feature. The bearded blade is slightly curved and incorporates two rearward facing prominently cut teeth and is balanced by a flat sided spike which is almost square in cross-section. There are no langets, the head being held by a wedge through the top of the shaft. The original handles of these axes were between 24 - 28” (61-71 cm) in length. The width between the blade and the point of the spike varies between 9.5 - 11.75” (24-30 cm). Type I axes are generally well marked, at least with U.S and many with the inspector’s view mark of John McLean which was V. IM. (I for Iain, the old Scots version of John). Gilkerson also cites one example as being marked with the manufacturer Hoffman. The Type II has a chisel shaped head with integral side langets. It has a single tooth slanted backwards cut out from the blade itself which is the reverse of how the teeth were formed in the Type I. The head size is similar to the Type I at 9.5 to 11.5" (24-29 cm) with the langets being 6 to 7.5” (15-19 cm) long. Examples may be unmarked or have the US stamp as on the one pictured below. As the advent of steam power and iron clad ships changed the nature of naval warfare the boarding axe became redundant. The naval axe that replaced the Type III, around 1860, was a short hatchet with the spike replaced by a hammer and two square cut nail-removing grooves formed in the lower part of the blade. It can no longer be considered a boarding axe and so is not included in this study. Total Length: 16 ” (41 cm) - shortened. The shape of the blade and spike, with minor variations, is very similar to the Type II. The single tooth was formed in the same way with the cuts often being deeper than on the previous model. The langets are not integrally cast but fixed either side of the shaft through a bowl shaped socket. The tops of the langets are formed so as to cap the socket in a dome shape when fitted. They are fixed to the shaft with two, or in some cases, three rivets. Gilkerson also identifies a variant attachment with the tops of the langets welded into a crested dome. These axes share the same general dimensions as the Type II. They are normally marked with US, the naval yard where constructed and inspector’s stamp in three lines. For example: U.S / N.Y.W / J.T is often found and indicates that it was made at the Navy Yard Washington and inspected by Captain Joseph Tarbell. Similarly N.Y.N.Y and N.Y.B would indicate the Navy Yard at New York or Boston. 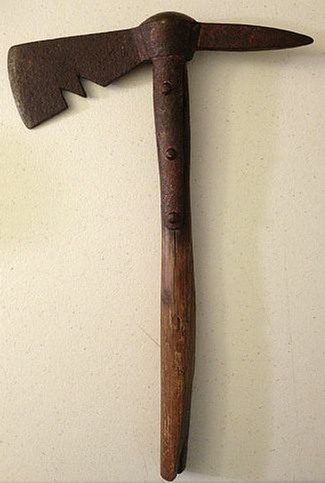 Rankin identifies this axe as a Type III variant but it seems more likely that it was modified in service with the spike shortened, heated and peened back into the hammer shape which was probably more use than a spike after the need for boarding axes had diminished. Many of these axes had their handles shortened for similar reasons.